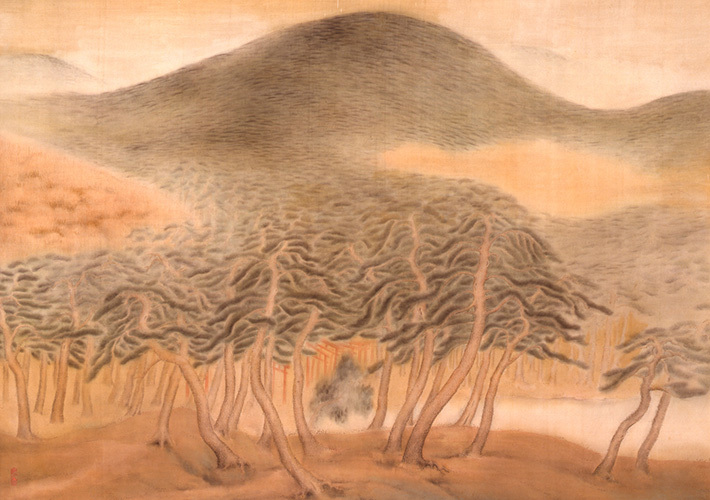 A characteristic representation of a pine forest stretching to the mountain top as if it is rustling and swaying. The pine forest stretches from the foot of the small mountain to the very top. The warm brown and deep green harmonize, presenting a landscape that is pleasant to look at. Looking carefully, you will notice that there are torii (archways) at the center. There is probably a shrine in the depths of the pine forest. The red tone of the archways provides a hidden accent. Incidentally, there is no sign of wind, yet the pine forest seems to be rustling and swaying. It is just as if each one of the trees has a life like an animal and is shaking its body. In the 1920s, when this work was created, representation of vitality was popular in various fields of art. In this work inspired by a view of the artist’s hometown too, the vital force the trees possess is expressed.